I spent a lot of time this weekend choosing thread for my current project, my Charming Chevrons quilt. I wanted to go with a neutral palette of grey or silver so I bought a bunch of different brands, weight and types to see which I like best. I am still on the search for my favorite thread and figured the only way I would find it is by making lots of quilts and trying out different threads. To see which thread would blend, I spread out a bunch of different colors over the top. I tried some Cotton Masterpiece, Isacord, Superior Sew Fine #50, and Superior Highlights in shades of taupe, silver and grey to see which I liked best. It’s hard to tell from the photo above, but there was quite a variety in the neutrals! My original plan was to quilt straight lines in the chevrons with a darker blending thread and then do some pebbling in the background with silver. I narrowed down my choices and stitched them out on a practice scrap. All of the thread choices looked great on the the Ash Grey fabric but I couldn’t find a thread that would blend well enough with the solid colors. Also I prefer the look of the pebbling on the colors rather than straight lines. 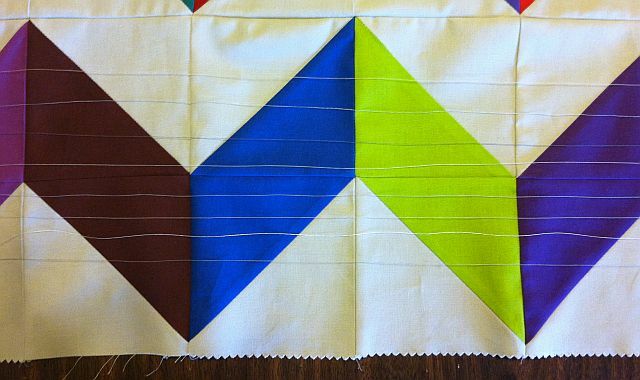 So I’m going to switch my plan – I’ll quilt straight lines on the background and then pebble the solid colors. That way the thread that shows will be a lot more interesting! I will write about which threads I finally ended up using once I start the actual quilting! On my last finished project I began taking notes of which threads I used and how I like them. 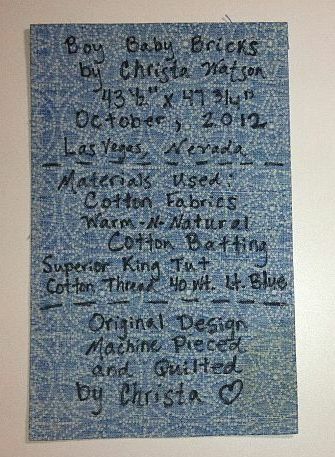 The easiest way for me to record this was by writing it down on the label on the quilt. 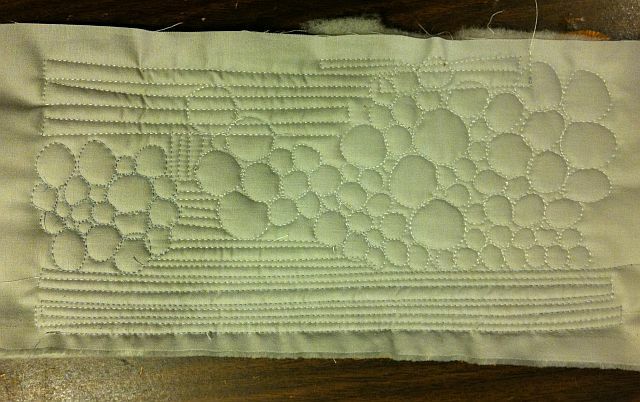 I always have good results when quilting with cotton but I want to have success using polyesters, too. For my Pink Baby Bricks quilt I used Isacord in the cream areas and was happy with the results. I had no breaks, no snags and I could really see the quilting. No wonder Leah Day recommends it so highly! Because I love quilts with tons of quilting all over the surface, I am also learning how to estimate how much thread I will use so I know how much to buy. For my Busy Hands quilt (throw size) It took a full 1600 yard spool of thread for each of the top and bobbin quilting. I prefer to use the same thread in top and bottom because I get better results that way. I really wanted to the quilting to stand out, not the thread, so I chose a very thin thread, Superior’s 60 weight Bottom Line for all of that quilting. The stitching looked great and it even blended it on the colored fabrics. However, I had a huge amount of thread breaks because the thread just wasn’t strong enough for my high speed free-motion quilting. I love all of the different quilting styles out there and the quilters promoting them. Leah Day likes to be very artistic with her quilting and really show off her awesome designs. Angela Walters prefers her thread choices to blend into the background. 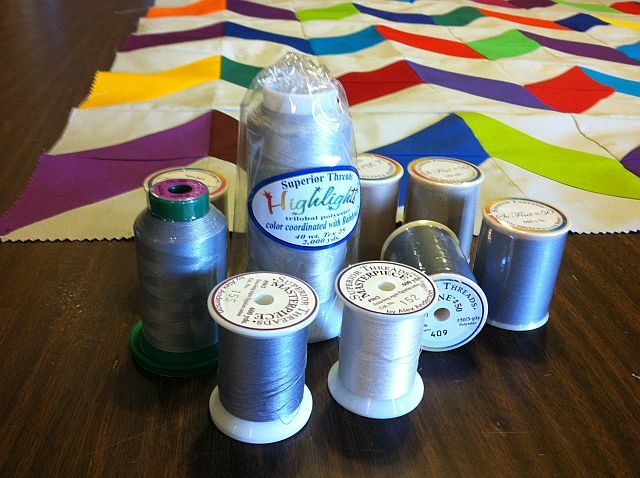 Deb Karasik is happy to change thread colors hundreds of times on the same quilt. Cindy Needham is a Superior Threads spokesperson and has her own distinctive heirloom style. Whether you love tons of quilting or prefer simpler designs, I think it’s important to try out a bunch of different threads and styles of quilting so you can find your own “voice”. Happy quilting! The pebbles do look good on the coloured fabric! LOVE the hands! That is so cool. Your quilting is beautiful! I love those hand prints and those pebbles look brilliant on the colour! 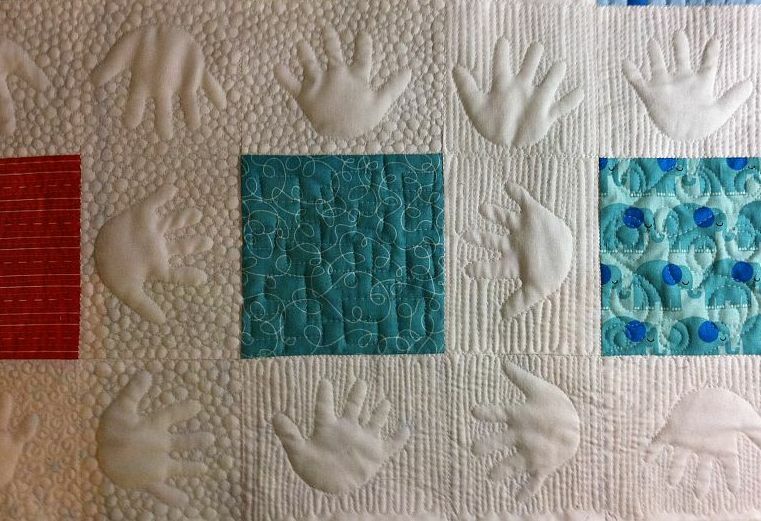 Love the quilting on your Busy Hands quilt – that is really impressive! I like the combination of pebbles and straight lines alternative. Looks beautiful, fresh and modern. Hmmm… I have been experimenting with different threads too. I know now what my machine likes and also feel that cotton would work better with my machine and just bought some Auriful threads to try. What kind of machine do you use for FMQ? I have a Bernina 1630 – Aurifil is next on my list to try! I just did a similar experiment last month on my blog (“Testing Different Values of Gray Thread”). It is interesting when the results don’t match our initial assumptions. 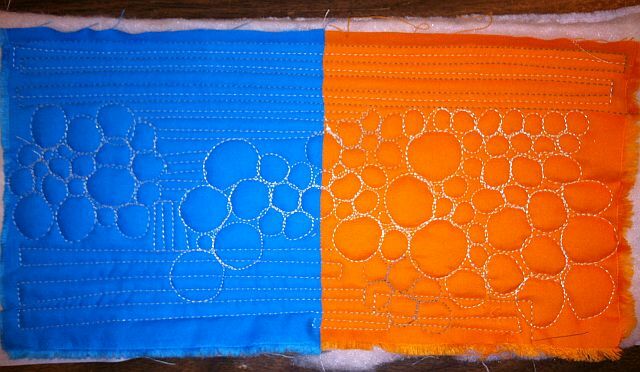 I also placed the thread on top of the fabric first, then did some test quilting. I wound up using a thread color that I was pretty sure I wasn’t going to use! After all the quilting, I am absolutely sure I made the right choice. I agree with you, too–the pebbles look great on your color blocks! Thanks for all the insight on threads for quilting. I like to quilt my own projects on my home machine so I try not to make anything bigger than a throw/lap size.